FEATURES. Heavy wall cast aluminum frame featuring a .125" thick prismatic polycarbonate lens with an internal refractor for low brightness and high efficiency. Energy efficient LED comes standard in multiple color temperatures to choose from. Corrosion and weather resistant oven baked standard bronze polyester powder coated finish. Built according to U.S. and Canadian safety standards. 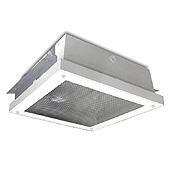 Suitable for damp or dry location covered ceiling. Not suitable for insulated ceilings.